Your body needs protein for the growth, maintenance and repair of body tissues and muscles. 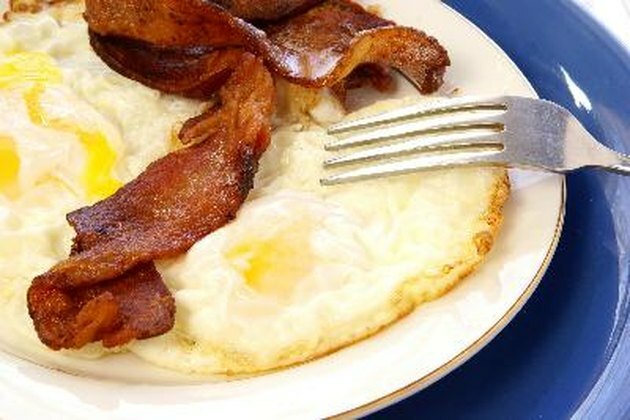 High-protein diets have become increasing popular the last few decades as an effective weight-loss method. However, eating a diet that contains only protein puts you at risk for missing essential vitamins and minerals found in other foods. Eating a healthy, well-balanced diet helps you avoid the adverse side effects of a protein-only diet. Eating a protein-only diet puts you at risk for digestive upsets, including constipation. Carbohydrates provide dietary fiber for the body, aiding in the softening of stools and elimination of waste products. Most high protein foods, such as meat and eggs, have no dietary fiber, and eating a diet of protein only eliminates carbs from the diet. High-protein foods also take longer to digest in the body, which slows the transit time of waste moving through the digestive system and prevents smooth bowel movements. A diet that contains only protein has no energy-producing carbs to fuel your body and brain. Carbs provide glucose, your body's primary fuel for movement, digestion and thinking. A protein-only diet eliminates this primary source of energy causing you to feel fatigued and lethargic. Eventually, the body will start to use protein as a source of fuel to replace the carbs, which takes it away from its own functions in the body. Inadequate stores of protein needed to build and repair muscles can cause the breakdown and wasting of muscle tissue and lead to increased fatigue. Eating too much protein might lead to decreased calcium in the bones long-term. Your body releases acids during protein digestion, which in effect increases blood acidity. To neutralize acidity in the blood, your body removes calcium from your bones to absorb the released acids. This reduces the amount of calcium in the bones and, without adequate dietary replenishment, loss of calcium leads to decreased bone mineral density, according to the United States Department of Agricultural Research Service. However, based on a review of recent research evaluating protein's effect on bone health published in the February 2010 issue of "Current Opinion in Lipidology," the authors to determined dietary protein could not increase pH levels -- blood acidity -- high enough to decrease bone mineral density. The effect of high protein intake on bone health remains a controversial issue. Eating a protein-only diet eliminates essential nutrients in the body, including complex carbs, healthy fats, vitamins and minerals. Carbs in the form of vegetables, fruits and whole grains provide your body's primary fuel source along with essential nutrients such as the B vitamins and magnesium, which increase energy and aid in muscle contraction. Healthy fats, such as nuts, fatty fish and olive oil help your body to perform necessary functions, such as maintaining hormonal balance, keeping skin healthy and absorbing vitamins. Fruits and vegetables provide a myriad of vitamins and minerals that help protect your heart and might prevent certain cancers, heart disease and stroke. Thus, a protein-only diet might put the body at risk of malnutrition and increase disease risk.